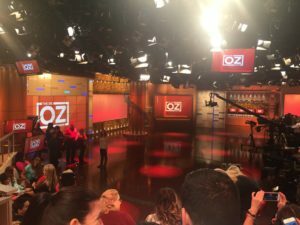 Today I was in the audience of a Dr. Oz taping, a first. I applied online and showed up on W 66th at 8:45 as directed. All men and women in line sat in the Audience Holding Room. Around 9:30 they ushered into the filming studio according to a letter or symbol on the back of our tickets. They first called the “Stars,” then the “VIP’s,” then the “O’s,” and I was a “Z,” the last group called. I felt myself regressing to elementary school when the captain chose his team one my one while I waited to be the only one left standing. I think age and race discrimination are alive and well because I was directed to sit in the highest seat, in the corner, with two other women who looked like me. They were in town to see a granddaughter’s band play in the Macy’s Thanksgiving Day Parade. The taping included Dr. Oz’s wife, Lisa, and their son, Oliver. The show featured healthy box lunches, chocolate cake, and exchanging one fat ingredient in a recipe for a healthier option. It will air sometime in January, and you won’t see me on TV, as I’m a “Z” in the upper back corner. The best part of the taping was Richie Bryn, Dr. O z’s warm-up comic. He kept us laughing and prompted us to whoop, holler, and clap. 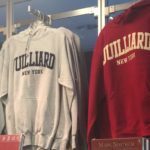 On my walk home, I stepped into the Juilliard gift store, a first. Note to self: go to performance there! Few people look at each other here, so I decided I was going to experiment and look into the eyes of every person I met on the sidewalk. A first. I was up to twenty-two people, and nobody made eye contact. Then a guy on a bicycle stared squarely at me. It freaked me out. I’ll keep my eyes to myself from now on. I went to a Post Office on 52nd, a first. The clerk was exceptionally cheery and kind, and even though I understood one word in twenty, together we mailed the package. In the evening I attended a three-hour class, Cooking with Wine, at Rustico on 39th, a first. Micol, skillfully guided ten students through preparing Italian foods I couldn’t pronounce. We didn’t drink wine while cooking, darn, but we poured some in each recipe. 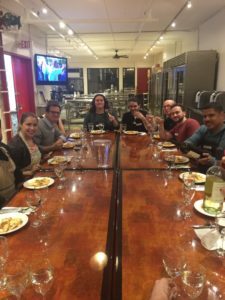 When we finished preparing the food, we relished our creations by dining together – with wine, of course. Five stars for sure. I slowly walked home on 5th Avenue. The crowds and Christmas lights were festive and enchanting. I’m still twinkling. Hi – I don’t think I had expectations other than our parent’s death, and it was very different. I know I feel angry (fear, frustration, hurt, and unfairness) and I know it is normal, so I don’t push it away. I also feel less anger, which is good. I think if she just would have smoked and chosen not to go through everything the doctors said, her death would make more sense. But, to be so committed to living and doing all the right things for a year and four months, and then dying anyway is one root of my many emotional levels. All we did to help her was not in vain, at all, because we contributed to her emotional wellness and had the gift of time with her.